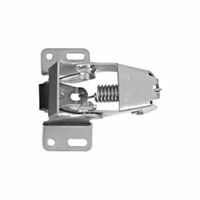 Replacement strikes for storm door latches. Fits 1/4", 3/8" and 1/2" strikes. Includes 2 shims. Visual-pack. Replaces jamb bracket for storm door closers. Compatible to the V1709 and V1346 door closers. Visual-pack. 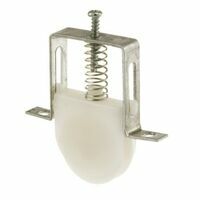 Replaces jamb bracket for storm door closers. Compatible to the V1709 and V1346 door closers. Visual-pack. Use on screen or storm doors for positive closing action. Steel construction with zinc finish. Polybagged. Use on screen or storm doors for positive closing action. Steel construction with zinc finish. Polybagged. Designed for doors and lightweight gates. Looped ends for installation. Does not include hooks. Boxed - Zinc plated finish. Use on screen or storm doors for positive closing action. Steel construction with zinc finish. Polybagged. Designed for doors and lightweight gates. Looped ends for installation. Does not include hooks. Boxed - Zinc plated finish. Slotted holes for universal use. Packed with installation screws. Slotted holes for universal use. Packed with installation screws. Looped ends for easy installation. Four diameter sizes for various applications. Designed for doors and lightweight gates. Steel wire spring. Visual-pack. Designed to absorb shock, preventing wind damage to screen and storm doors and closers. Visual-pack. Looped ends for easy installation. Four diameter sizes for various applications. Designed for doors and lightweight gates. 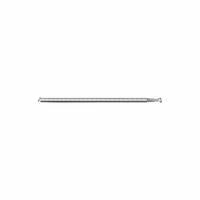 Steel wire spring. Visual-pack. 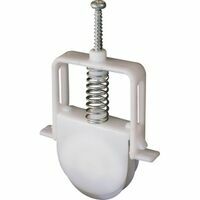 National Hardware Spring/Chain Door Stop, Series: V1355, Suitable For Use With: Screen, Storm Doors and Closers, Steel, Zinc Plated, For Absorb Shock, Preventing Wind Damage to Screen and Storm Doors and Closers High strike offset. Slotted holes for easy adjustment. For wood or metal doors. Includes screws. High strike offset. Slotted holes for easy adjustment. For wood or metal doors. Includes screws. 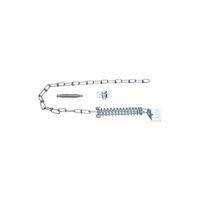 National Hardware Door Closer Part Kit, Series: V1352, Steel, Zinc-Plated, Includes: (1) Jamb Bracket, (1) Door Bracket, (4) Long Screws, (4) Short Screws and (2) Attachment Pins, Used to Replace Damaged Door Closer Brackets Kit is designed to replace damaged door closer brackets. 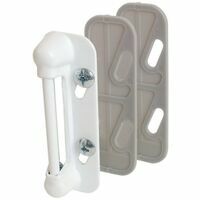 Kit contains: 1-Jamb bracket, 1-Door bracket, 4-Long screws, 4-short screws, and 2-attachment pins. Door closer NOT included. Visual-pack. Prime-Line Sliding Screen Door Roller, 1 in Roller Diameter, 1/4 in Roller Width, Nylon, Includes: (2) Rollers, Top/Bottom Mount, Concave Type Roller Edge Prime-Line Sliding Screen Door Roller, 1 in Roller Diameter, 1/4 in Roller Width, Nylon, Includes: (2) Rollers, Top/Bottom Mount, Concave Type Roller Edge High strike offset. Slotted holes for easy adjustment. For wood or metal doors. Includes screws.